Then, using the strong dollar to attract foreign investment, the Federal Reserve and the Clinton administration floated the U.S. economy throughout the 1990s on what was called the dot.com or “tech” bubble. This bubble collapsed in 2000-2001 with an enormous loss of asset value to U.S. and foreign investors, including massive loss of pension funds. In 2000 George W. Bush was elected president. Instead of taking steps to rebuild the U.S. manufacturing economy, the Federal Reserve under Chairman Alan Greenspan slashed interest rates and removed the regulatory controls, resulting in a huge inflation of home prices through the housing bubble. Cash entering the economy through mortgage lending was the economic engine for the Bush presidency. Taxes from the housing bubble paid for much of the Afghanistan and Iraq wars. Other investment bubbles in equities, hedge funds, derivatives, and commodities also took off. All this collapsed in the financial crash of October 2008. Now, President Barack Obama is trying to restart the U.S. economy by a huge infusion of federal government money through the largest increase in the national debt since World War II. The policy of creating economic growth through credit bubbles is speculation-based and highly inflationary. It’s why the U.S. dollar has lost 85 percent of its value since 1965. But credit will have to be tightened soon, and the federal deficit will have to be reduced to keep the value of the dollar from declining further. This is likely to lead to a very weak recovery from the current recession and will leave households, businesses, and government at all levels still deeply in debt if not bankrupt. So Congressman Paul is saying, quite logically, that the Federal Reserve needs to be attacked in its very ability to create these destructive inflationary bubbles. The Free Competition in Currency Act would attempt to do this by introducing gold and silver as a legal currency along with Federal Reserve Notes. Unfortunately, there is not enough gold and silver in existence to fund the monetary requirements of modern economies. Trying to restore a metallic currency that never really existed in sufficient quantity since this nation was founded would only replace control of the economy by the banking system with control by gold and silver speculators. Congressman Paul’s solution is largely ideology-driven to satisfy his libertarian constituency. That’s why legislation like this which has no chance of passing and wouldn’t work if it were implemented is more a political protest than a genuine attempt to solve the problem. A metallic-based currency, one of whose purposes is to uphold the value of money due to its scarcity, is based on a flawed concept. Money, even based on gold and silver, does not derive its value from being scarce nor is an abundance of money itself inflationary. Actually, money should exist in sufficient quantity and availability to move all the legitimate trade that is waiting to be moved. Money is a medium of exchange and should be nothing more than that. When used by the banking system for wanton speculation, as money is today, it’s an abuse. But to artificially restrict the availability of money when people need it to trade and earn a living is also an abuse. The underlying purpose of the proposed Free Competition in Currency Act is actually to support the private minting of metallic coinage such as the “Liberty Dollar” and free such coinage from the sales and capital gains taxes that reduce its value. But a serious proposal to make privately-minted money usable in trade should also standardize its gold and silver content and fix its value, which this legislation fails to do. Therefore the only value of the Act would be to give the Liberty Dollar special privileges as an investment option. Nevertheless, something must be done about the disastrous state of monetary policy, and none of the current proposals to restructure the financial regulatory system or reform the Federal Reserve would address the underlying issue of the inflationary nature of a monetary system based on federal government debt, financial speculation, and the supremacy of banking over the manufacturing sector. A better solution would be to look at the dozens of local currency systems that are springing up around the nation, as private cooperatives begin to print and distribute their own local currencies. These currencies do what money is supposed to do. They act as a medium of exchange that monetizes the labor and resources of localities and regions. These currencies consist of alternative paper notes and computer entries. As this movement continues, it is conceivable that someday different currencies could begin to be knitted together by computer databases and networks, so that their value would reach across jurisdictional lines and become a new type of national or even international monetary supply. This is what governments should be promoting, Think what would happen if first cities, then states, then the federal government began to accept these currencies in payment of taxes, fees, or utility bills. Such currencies would be based on the value of production within the economy and very well could replace Federal Reserve Notes in many instances. This is already happening in business bartering networks and with the use of other forms of value, such as airline frequent flyer miles, exchanged in trade. Of course the same thing is happening in many other parts of the world. Local currencies owned and distributed by producer cooperatives rather than dictatorial central banks allied with central governments deeply in debt may very well be the wave of the future. Of course local currencies take us in the opposite direction of the tyranny of the international financiers and their desire to consolidate world currencies into the handful they can effectively control. 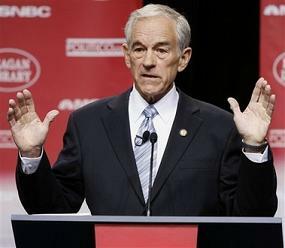 Congressman Ron Paul is to be commended in challenging the legitimacy of the Federal Reserve money monopoly and getting people to look in the direction of a monetary system that serves rather impoverishes us.